Strawberry season is in full swing, so we took advantage of a quiet morning (and because we needed to bring dessert to a family dinner that evening!) and headed out to Boxx Berry Farm to do some picking. 1. Don’t wear flip-flops: Janie and I both did and even though the dirt was dry, our feet were filthy by the time we were done. 2. Go first thing in the morning: It was cool and overcast when we got there at about 10 a.m., making for perfect picking. There was only one other person picking when we got there, but as we were leaving, at least six more cars arrived. 3. Don’t wear white: Or anything that you care about getting strawberry stains on. Your kids will wipe their hands on their clothes as they pick. You might too. Just make it easy and dress in dark clothes or clothes you don’t care much about. 4. Drive all the way out to the fields: We made the mistake of parking in the little parking lot behind the shop, up front, but quickly realized that the u-pick fields were way out there. You can drive back there (slowly) and it’s fun to catch a glimpse of what else is growing along the drive. 5. It doesn’t take forever: We picked for about 30-minutes and had enough strawberries to make a huge batch of strawberry shortcake for dessert that night. I think about six-pounds. Unless you’re really going for it, intending to pick buckets and buckets of berries, I’d consider this a morning or afternoon activity, rather than an all-day affair. 6. Learn to pick the right berries: The gal running the stand gave us a few pointers, including that the dark strawberries were probably too mushy to pick (she was right) and that the strawberries that came off with their stem should be eaten today. 7. Get in there for the best berries: You really have to dig into the plants to get the best berries. The ones along the border of the plants were often yucky, with the gems tucked away under the protective leaves. Don’t be afraid to get in there… and to let your kids get in there. I didn’t seem like you could hurt them very easily. 8. Make plans: Our plan was to make shortcake with our berries, but if we hadn’t, we still would have needed to eat or freeze the berries that we picked, pretty quickly, as I don’t think they would have lasted more than a couple of days on their own. 9. Head straight home: We made the mistake of running a couple of errands after we picked our strawberries and I think that they were pretty ripe by the time we got home! 10. Wash as you eat: Did you know that you shouldn’t pre-wash strawberries? It makes them go bad quicker. Wash them as you’re eating them, in smaller batches, to prevent gross, squishy strawberries. Like I said, we picked our strawberries at Boxx Berry Farm (6211 Northwest Road, Ferndale) and we loved it there. They were nice and helpful and the strawberries were gorgeous. For that half-full crate of strawberries, it was about $10, FYI. Any berry picking tips to share? 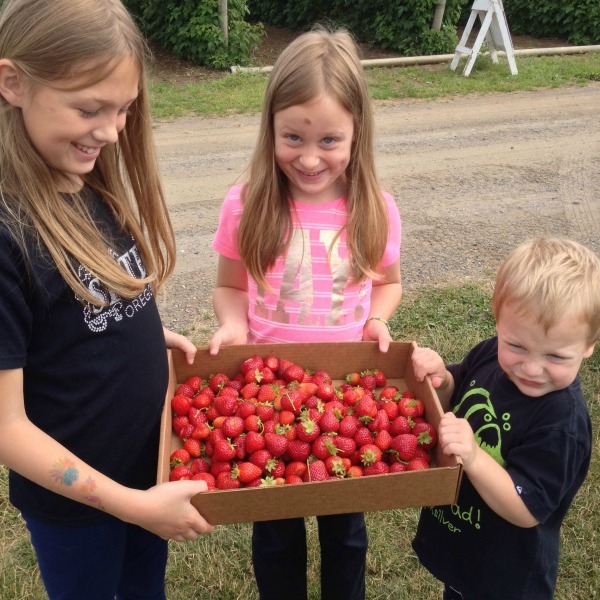 What’s your favorite u-pick strawberry farm in Whatcom County? 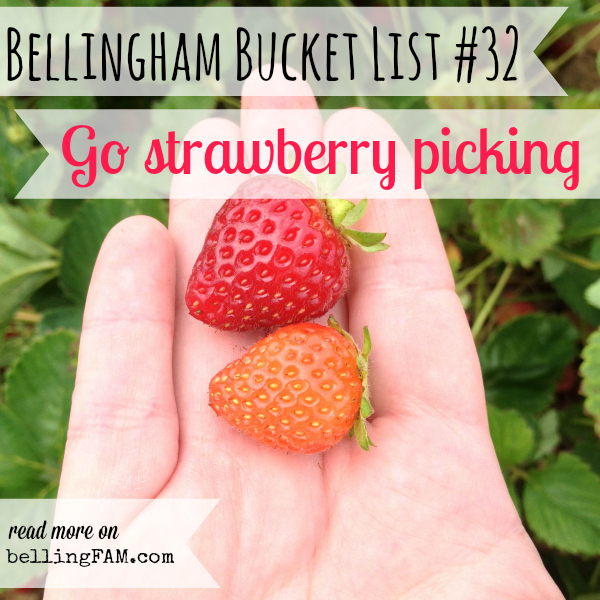 This entry was posted in Bellingham Bucket List, Outdoor Fun and tagged Bellingham Bucket List, Boxx Berry Farm, Ferndale, Outdoor Fun, Strawberry Picking, Summer, U-Pick Farms on June 23, 2014 by Katie Kavulla. My friends and I also have gone to bjornstad farms on old guide. They have a facebook page. They are smaller and not so parky, but they have pet pigs that the kiddos can feed. They have always been nice while we were there and I think they are a bit cheaper then boxx’s. The best part about Barbie’s is that they sell late-season berries which means you can get fresh strawberries from them after all the other farms are done for the year. I skipped the picking this year and just went for the easy route of buying them instead. I’m still scarred from having to ride the berry bus and spend what felt like months (it was probably 2 weeks, tops) as a kid picking berries.